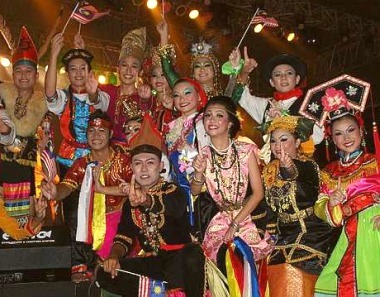 THE ninth edition of the Borneo Cultural Festival (BCF) ended on Sunday night in a myriad of colours, joy and festivity. It was a fitting finale to a nine-day melee of music, dance and cultural performances by the Chinese, Malay-Melanau and Dayak communities specially designed to entertain the visitors nightly. The festival this year was another success with more than 20,000 people thronging the Town Square to feast on a potpourri of colour and culture, including that of foreign dance troupes. Unity: Members of Sanggar Budaya from Miri posing in different costumes. The area around the main stage on Sunday night was packed with people not wanting to miss the troupes including Ningde City from China, China Cultural University from Taiwan, MIT Street from Taiwan, Sanggar Seni Bhayangkara Sintang from Indonesia, Sanggar Terabai from Pontianak, and Akasha and Superbang from Kuala Lumpur. Local groups Baltti Dancers from Batu Lintang Teachers Training College in Kuching, Charma De Authentic Dance Group from Sarikei and Sanggar Budaya from Miri made the night merrier with their performances. The night culminated with a colourful display of fireworks. French tourist Sophie Guignard said she was captivated by the performances. “I have never heard of BCF. I arrived in this town with my boyfriend Karim Kamar on Saturday morning. When the hotel staff told me about BCF, I was simply overwhelmed and promised myself not to miss it,” said Sophie, an event manager. Unique: An electrifying performance by an Indonesian group. She said she had never seen an event of this magnitude where locals and foreign troupes came together to showcase their dances. “It’s interesting to see the performances of the different troupes. It’s something I am fortunate to witness,” she added. Sophie, armed with a digital camera, snapped pictures of the dances and some of the troupes after the closing ceremony. Febry, a member of the Sanggar Seni Bhayangkara Sintang troupe, said her group was honoured to be invited. “It is a golden opportunity for us to showcase our dances. We would like to come again next year,” she added. Eventful: The China Ning De performing a dance item. In his closing speech, Social Development and Urbanisation Minister Datuk William Mawan Ikom described the event as a good platform to showcase and preserve the state’s rich cultural heritage. Mawan said that BCF brought the people of the town and others together as a community. “We have been described as a state where IMalaysia is in action. This gives us pride, but we need to uphold it,” he said. The festival’s organiser, Sibu Municipal Council, plans to upgrade it to international status next year.